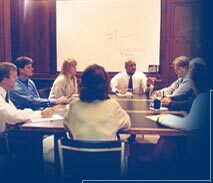 The clients and collaborative business partners of First Communications, Inc., are diverse in many ways. From divisions of multi-national manufacturing companies to individual retail stores - from consumer products to industrial products - from collectible art to venture capital - First Communications provides innovative solutions to build business. We can do the same for your company – no matter its size, industry, product or service. -	Trinity Marine Products, Inc.
-	McConway & Torley Group, Inc.
-	Trinity Railcar Parts, Inc.
-	The Marketing Source, Inc.